As always, when it comes to tasks that seem to be rather inconvenient, we need a trigger to do those: we take down the garbage when the whole kitchen smells, we go to the dentist when the bad looking tooth starts to hurt – and we change the tires on our bikes when it’s not at all safe to ride anymore. Or not even then. I should have bought the new tires a long, long time ago, but I kept using it for the last half a year, and did another few hundred kilometers on them – luckily, without any accidents. The trigger in my case was a friend with a flat tire near my apartment and the ever stronger feeling that I’m going to die the next corner. 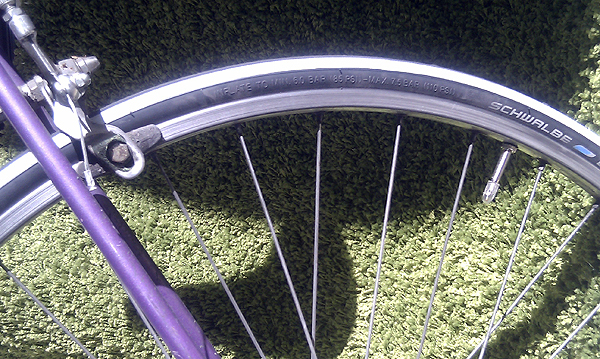 So, at last, from today on I’m a happy urban cyclist again, riding on a safe – but still rather ugly – bike. And this all took 30 minutes tops (by the way: thanks Katrin for the help).